Actually he’s at Petsmart Bellmore. 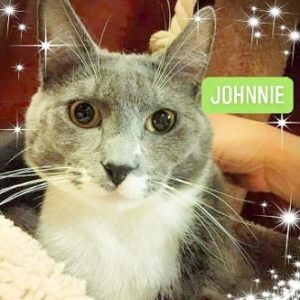 JOHNNIE is a handsome gray & white tuxedo who was trapped in Bay Shore as a baby, and then fostered by his rescuer. He’s a year & a half now, and eager to begin his adopted life with YOU. Petsmart Bellmore is on Merrick Road. JOHNNIE will gladly call you an Uber. This entry was posted in Adult, Cats, Male, Petsmart - Bellmore. Bookmark the permalink.